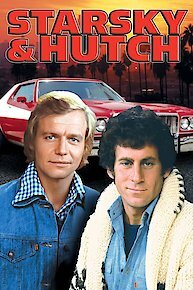 Starsky and Hutch is an American cop telvision series about the exploits of two Southern California police officers: David Starsky (Paul Michael Glaser) and Kenneth "Hutch" Hutchinson (David Soul). The duo patroled the San Francisco Bay area in a souped up red Gran Torino with a white stripe. Georg Stanford Brown, Jack Starrett, Fernando Lamas, David Soul and Paul Michael Glaser directed several episodes. The show also features several weekly co-stars such as Charles Cyphers, Kristi McNichol, Alex Rocco, LaWanda Page, Richard Lynch, and Robert loggia. Starsky is a veteran of the U.S. Army, who is talkative, smart and more inclined to tak chances, while Hutch is more laidback and intellectual. The duo took on a number of crooked characters and cracked several tough cases by utilizing their police smarts. Starky and Hutch's Captain Harold Dobey (Bernie Hamilton) is a stern no nonsense cop, who is always on the duo's case. The addition of Dobey to the cast was seen as a way to present African Americans in a more positive light. When cases reach a dead end, Starsky and Hutch rely on the information given to them by local hustler Huggy Bear (Antonio Fargas). Huggy is smooth-talking, streetwise and owned the local bar, which is often frequented by a wide range of low brow types. Huggy Bear's character gained immense, worldwide popularity. A spin-off series featuring the character never materialized. Both Starsky and Hutch are portrayed as bachelors with no children. However, the characters do have love interests on the show from time to time. Although the show features less violence than many shows, the criticism forced writers to move away from more violent themes and concentrate more on romance and social themes. A contract dispute with Paul Michael Glaser ended with him temporarily written out of the script and replaced by Roz Kelly, who portrayed Officer Linda Baylor. A prestigious political figure, bent on revenge, critically wounds Starsky and plots Hutch's execution. When a Model, an old girlfriend from Hutch hears she has cancer, she decides to contact a hit man. She doesn't want to die painfully and wants a unpainful death. But when the doctors discover her body is killing the disease, Hutch has to find the hit man before he kills her. Starsky and Hutch go undercover in the fashion world. While they are concentrating on their detective work, they receive an unusual offer from a women who wants to help them. The butch duo pose as temperamental hairdressers as they pursue a master diamond thief in town for a big auction. But the Baron proves a cunning adversary for Tyrone and Marlene. Starsky and Hutch is currently available to watch and stream on ABC. You can also buy, rent Starsky and Hutch on demand at Amazon, Google Play, iTunes online.